My first visit to Montreal was in 2014. I totally gorged on poutine. (French fries drowned in gravy, topped with cheese curds and meats). I had “gourmet” poutine–fries topped in foie gras. Decadent. 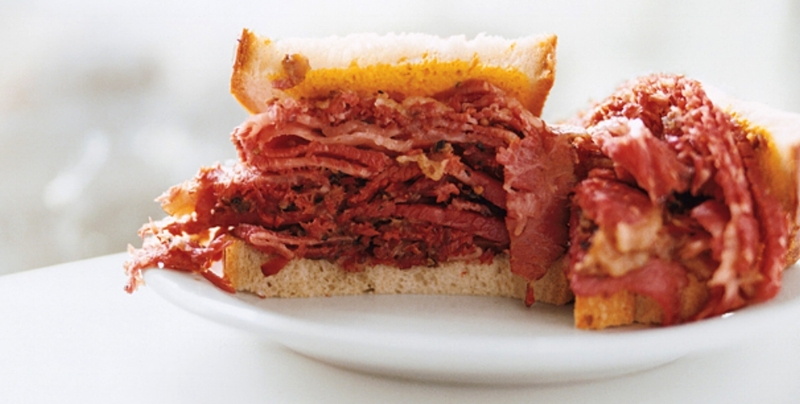 But their Smoked Meat Sammies are the beast... I mean best. There are 3 ways to make this. If you have a smoker, you’re set and can use the dry rub in the ingredients below. If you have a grill, you can smoke the meat with wood chips over indirect heat for a while and also use the dry rub. And if you have only a crockpot, that’ll work too! Over medium heat, and preferably in a cast iron skillet, toast the seeds, the allspice, and the peppercorns toast the peppercorns, coriander seeds, cumin seeds, fennel seeds mustard seeds. (You do not need to put any oil in the skillet to do this). It should only take about 5 minutes to toast everything, stirring frequently. You will know you’re near done as the spice mix starts to smell (good) quite a bit. Once the spices are toasted, you’ll need to grind them. If you have a mortar and pestle and have been looking for reasons to use it, now’s your chance! You can also use a food processor here. ‍First rub half of the spice mixture all over the brisket–and really put some oomph behind it – as in rub it in! Like a brisket massage. Let the brisket marinate in its new goodness for at least an hour–but ideally overnight. When it’s time to cook, preheat your oven to 250 degrees F.
Remove the brisket from the oven and remove the bacon. Now add (sprinkling is fine as the meat is now very hot) the other half of the spice mixture to the meat. Smoke the brisket with the wood chips in a smoker over low flame for about 20 to 30 minutes. Place the brisket (fat side up) in center of the cooking grate over the drip pan. You will not turn the brisket during the cooking time at all. Grill the meat until your meat thermometer registers 180°F. (I can’t give you a time on this as charcoals and grill sizes vary. Just note, this could take about an hour or more). When it’s done, remove the brisket from the grill and let rest 20 minutes. Shave the meat into thin slices. Pile the meat generously high between two slices of rye bread slathered in yellow mustard. I like serving with a bowl of pickles and some of your favorite potato chips.